It's official! Sometime in the near future, we're getting a Deadwood movie. The notion has been kicked around for quite awhile, with some of the actors involved letting it slip that a Deadwood revival was in the works. Those accounts, as it turns out, were not exaggerated. In fact, it is quite the opposite. Speaking with TVLine, Michael Lombardo, HBO's programming president, confirmed that Deadwood creator David Milch has been given the green light to bring the incredibly popular yet short lived Western back. No plot details have been revealed at this time. Here's what Michael Lombardo had to say about the impending Deadwood movie. "David has our commitment that we are going to do it. He pitched what he thought generally the storyline would be - and knowing David, that could change. But it's going to happen." It sounds like the movie will debut on HBO, not in theaters. But that could also change. Michael Lombardo went onto say that they decided a movie was the better option, as opposed to resurrecting the series as a limited series. The decision to move forward came from, what the executive calls, a 'palpable' sense that this story isn't finished. Michael Lombardo continued, saying this. "[He] has something left unsaid. I've known him for a while and it feels like it's something he's not done talking about." When will the Deadwood movie actually happen? No shooting start date has been announced, and it's not clear when it will premiere on HBO. At this moment, David Milch has another project that he is working on. So a timeline is unclear. The programming president continued with this. "The understanding is that when he is done with that he will turn his attention to [writing the] script for the Deadwood film." One of the reasons, aside from its overwhelming budget, that Deadwood ended early was that it was becoming increasingly harder to wrangle the ensemble cast. All of whom have gone onto have quite illustrious careers since the show came to an end in 2006, exactly ten years ago. Bringing everyone back for even just a movie still poses a scheduling nightmare. How will that be handled? "I'm going to leave that in David's hands. He's confident he will be able to. The cast is unbelievably [tight]. Some casts and creators form a bond that becomes relevant for the rest of their lives. This was a defining moment for a lot of them." Deadwood is set in a mining town that was not part of any U.S. state or territory in the post-Civil War years, and thus was literally lawless. Deadwood attracts people looking to get rich after a huge gold strike, as well as those looking to capitalize on the lack of organized law in the town, built on land stolen from the Sioux. 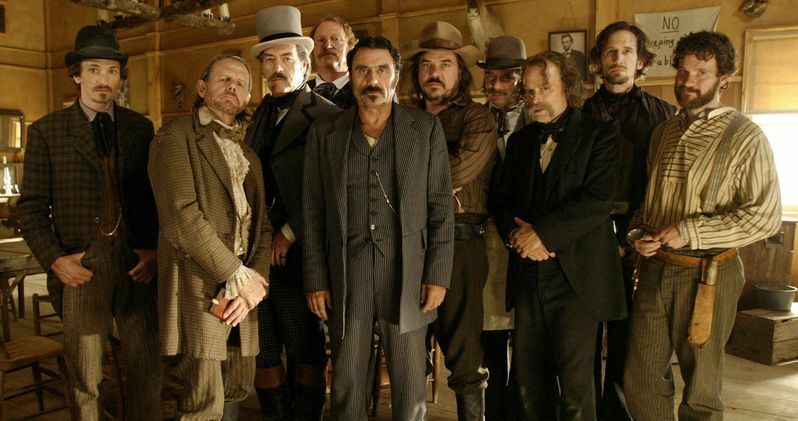 The Deadwood movie was originally being pitched for a possible 2017 premiere. If everything comes together over these next couple of months, that could possibly still happen. If not, we will undoubtedly see it happen in 2018. What do you think?